Sam Allardyce accused Everton fans of ungratefulness after a 1-1 Premier League home draw with Southampton was greeted with resounding boos. Tom Davies' deflected strike in the sixth minute of stoppage time cancelled out Nathan Redmond's 56th-minute opener, extending the Toffees' unbeaten run to five matches. But it was not enough to satisfy Everton supporters at Goodison Park, who voiced their disapproval over a performance largely devoid of chances and attacking intent. 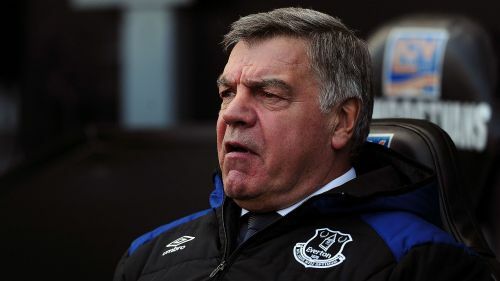 Allardyce accepted the response to a lacklustre display, but took issue with a perceived lack of recognition for his players' efforts in securing a comfortable top-half position in the Premier League. "You get boos wherever you go when you don't play well. I thought we were terrible," he told reporters. "But you've got to forgive these boys. The fans should forgive them a little bit for what they've done and how hard they've worked to get this club out of trouble. "But there seems to be no credit for their achievement. And I'm not talking about me, I'm talking about them. The effort they've put in, the drive, the willingness to take Everton to the top eight. "It appears that's no credit to these players. It's rather a shame for the effort they've put in." Mark Hughes was similarly upset, believing questionable decisions from referee Jon Moss cost Southampton a two-point buffer to 18th-placed Swansea City, although his side did move out of the relegation zone. Everton were awarded a contentious free-kick, beyond the allotted four minutes of stoppage time, which eventually led to Davies' last-gasp equaliser. "We're disappointed with the referee and his assistants if I'm honest," Hughes said. "Nathan Redmond did great to dispossess their centre-half. The linesman, who is clearly closer to anyone else, certainly closer than Jon Moss, he didn't raise a flag. Jon Moss was about 30 yards away and decides it's a free-kick, in his opinion. "They then allow them to restart 10 or 15 yards in the wrong position. We were trying to get back into position and never really recovered from that point. "It shouldn't be right that before games we're worried about referees and their officials and whether they'll play a part. That happens too often in the Premier League, unfortunately." Are Everton Heading In The Right Direction Under Marco Silva?